Nuno Roque’s ‘My Cake’ has been officially selected for the 2015 Videoformes Award – 30th International Digital Arts Festival in Clermont-Ferrand (France). The festival celebrates contemporary video art creation and is a permanent observatory of the evolutions of video & digital arts. 25 countries will participate in the competition. The piece is the first look at Nuno Roque’s upcoming music project. 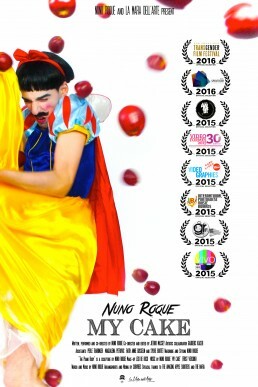 Written by Nuno Roque, it was directed in collaboration with British artist Jethro Massey and produced by La Mafia Dell’Arte and artistic collaborator Gauderic Kaiser. ‘My Cake’ is also competing for the Prix Videoformes 2015 which rewards originality in writings and artistic research. The 2015 Videoformes ceremony will be held in Maison de la Culture. Winners will be announced on Saturday, March 21st.